We are delighted that there is now more choice of where to buy your Batribike electric bike. New stockists are now listed on our website. Welcome to our new dealers, In the north, Ian Gerrard Cycles, who are in Bedlington, Northumberland. Over in Merseyside, Wirral E-Bikes at N&C Jet Ski and down on the south coast it's a big hello to Stowaway Bikes in Birdham, West Sussex. Whew, what a busy week we had last week. The Motorhome and Caravan Show at the NEC showcased new models for the coming year. Reduced ticket prices this year meant a record number of visitors, the opening day saw 15,000 leisure enthusiasts packing the halls and 25,000 on Saturday. The Batribike stand was busy everyday with show goers finding out about the attractions of Electric Bikes, many of them tried one out for themselves in the test ride area. We were delighted to be asked by Chausson to be part of the demonstration of their 'Bike Up' system of storing bikes in a motorhome garage. We lent them a Granite which we think you'll agree looks very stylish. There was great excitement in the office when the Gadget Show phoned and asked if they could borrow the Breeze for an up coming programme. We packaged the bike up and sent it off, we didn't know what the programme would be about and so waited with interest to hear back. The Bike duly returned and we were told the date of the show, series 16, episode 8. 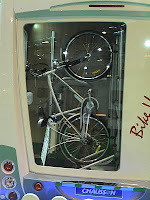 We had seen electric bikes on the Gadget Show before and knew that they get a huge range of bikes to test and that there was a good chance that ours would not be pictured, let alone mentioned. The premise of the challenge was car valeting, Ortis and Pollyanna needed to choose a compact means of transport to collect cars quickly. The show went out on Monday, with a repeat showing this coming Saturday. We were delighted that right from the beginning of the segment there were close up shots of the Breeze, part of the attraction may have been it's lovely Wine Red colour - there's no doubt, it is an attractive bike. Pollyanna chose to test ride the Breeze and commented on how easy it is to fold. Whilst she felt it wasn't as fast as one of the other bikes we know that it's gentle 'no drama' power is a hit with our customers. What a great endorsement of our bike. Exposure on TV on the Gadget Show is great for the electric bike industry as a whole, it shows the diverse range of bikes available to the consumer and raises awareness of the many and varied uses of electric pedal power. The new venue for the Cycle Show proved to be popular with electric bike manufacturers with several brands new to the show displaying their bikes. The increase in the size of the test track meant that it was easier to get a real feel for the bike you were trying. We had great feedback from the trade and retail customer alike with many commenting on how smoothly the power assistance came on and what great value the Batribike bikes are for the amount of technology they include. It was great to catch up with some of our current stockists who came to look round the show and visit us on the stand. 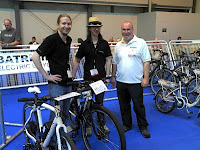 We also had a chance to chat with other BEBA members about the electric bike industry as a whole. I hear the show will be even bigger next year with companies that didn't attend this year clamouring for a space at next years event. We are certainly looking forward to being there again.